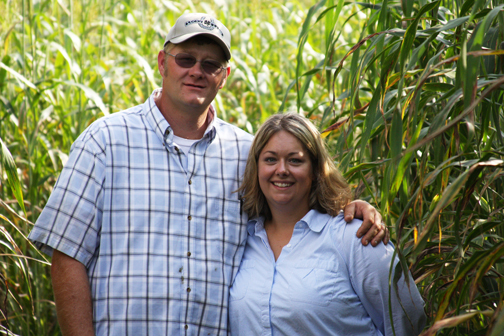 Anything other than a normal weather cycle can mean trouble for Amy and Jason Ladd, owners of Lucky Ladd Farms in Eagleville. The Ladds opened their farm in 2009, and this was their fourth fall working the 60 acres. They have the largest petting zoo in the state with hundreds of farm animals, including alpacas and miniature donkeys. Their fall festival has a a pumpkin patch, which supports five other area farmers, as well as rides, games and activities. They also have a four-acre corn maze that would have struggled because of this summer’s drought had they not set up a drip-irrigation system. “We had a pretty bad drought in 2010, and since then we have used drip irrigation so that when we did have drought conditions, like we did again this year, it would not affect the maze,” she says. The U.S. Department of Agriculture predicts corn production nationwide will be down about 13 percent this year because of the weather, with some states hit harder than others. But despite the summer’s drought, those who waited just a bit to plant were rewarded with heavy rains at the end of the season. “Everyone told us we probably had the best looking corn in Sumner County,” says Karen Pulley of Shuckle’s Corn Maze in Gallatin. This was Pulley’s third year leasing the land to run the seven-acre corn maze, and each year the weather has been less than ideal. They have had to try different tactics to ensure the best crop possible, like adjusting the planting and harvesting schedules.